Read more about updates on the development blog and/or follow @mdoudoroff on Twitter. 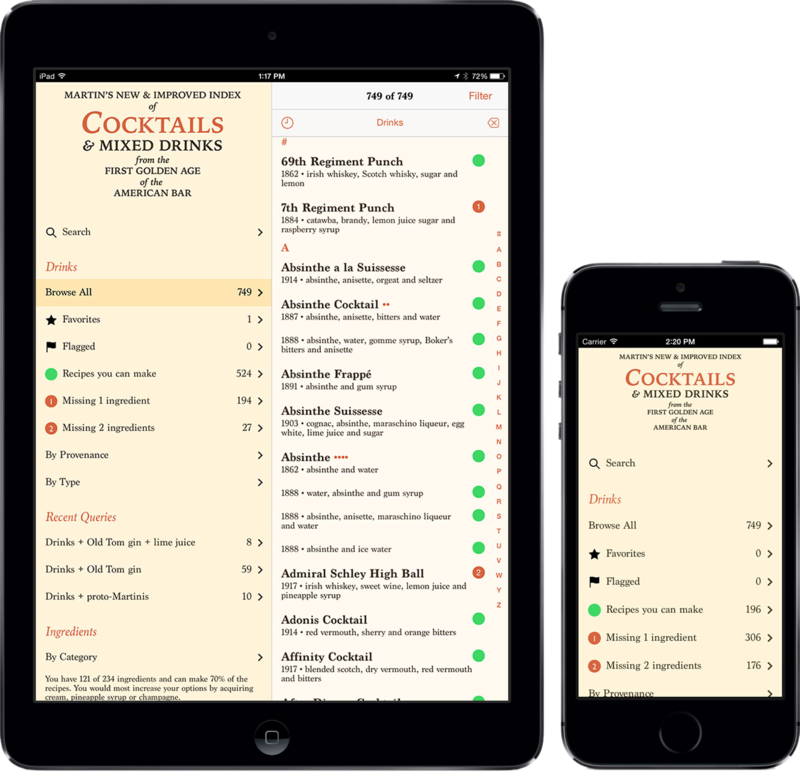 Martin’s Index of Cocktails and Mixed Drinks is a practical reference to the drink recipes of the first “golden age” of the American Bar (1850s until Prohibition) plus the mid-Century decades as a global phenomenon. Pretty much all the formulas of interest from Jerry Thomas, Leo Engel, George Winter, O. H. Byron, Theodore Proulx, Harry Johnson, “Cocktail Bill” Boothby,William Schmidt, George J. Kappeler, Louis Fouquet, Tim Daly, Stuart Thomas, Charles S. Mahoney, John Applegreen, Jack A. Grohusko, Jacques Straub, Hugo R. Ensslin, Tom Bullock, Robert Vermeire, Harry McElhone, Harry Craddock, Charles Baker, Ted Saucier and others! With full citations! The ideal companion to David Wondrich’s seminal book Imbibe! and to the amazing vintage cocktail book reproductions from Cocktail Kingdom!